ON THIS DATE (September 3, 1986) ... 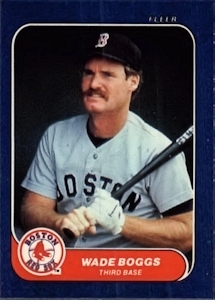 The Red Sox came back in the bottom of the ninth for a 4-3 victory over the Texas Rangers on a run-scoring walk-off double by Wade Boggs. The win went to Bob Stanley, the 100th of his career. The Sox found out how tough knuckleballer Charlie Hough could be in the first inning. With one out, he walked Marty Barrett and Bill Buckner. But then he induced Jim Rice to ground into a 6-4-3 double play. The Rangers took the lead with two out in the second. Greg Petralli hit a towering double off the wall in left. Toby Harrah singled to drive him in. The Red Sox evened it up in the third. With two out, Boggs crashed a homer into the Ranger bullpen, his eighth of the year, tying his career best. Rice singled with one out in the sixth, moved to second on a ground ball by Baylor and scored on Armas' ground single past second to give the Red Sox a 2-1 lead. But Petralli struck back for the Rangers with two out in the seventh. His line drive eluded Dave Henderson, who tried for a backhand catch, and went for a triple. Harrah followed with a roller to third which Boggs threw away, and Texas was back in business. In the bottom of the seventh, the Red Sox succeeded in getting rid of Hough with two out and regained the lead against Mitch Williams. Boggs singled to center and moved to third as Barrett pulled a Hough knuckleball past third for a hit. Williams took over and Buckner rapped his third pitch for a solid single to right, scoring Boggs and putting Boston ahead, 3-2. Dale Mohorcic took over and retired Rice on a ground ball. Stanley came on in the ninth and quickly dug a hole for himself by giving up ground singles to Parrish and Ruben Sierra. Rookie Bob Brower ran for Parrish. Stanley struck out Pete Incaviglia and got Harrah to hit a one hopper back to the mound. But Stanley's throw to second was off line, and shortstop Spike Owen, who had a hard time making the force play at second, threw wildly to first. Buckner prevented an error by coming off the bag but didn't notice that Brower was heading home. When he looked up, he dropped the ball and Brower scored the tying run. In the ninth, LaSchelle Tarver was running for Mike Greenwell, who led off with a pinch single off Mohorcic. The Sox tried to move Tarver on a bunt, but Spike Owen struck out on three pitches. That brought up Boggs, who found a hole in the Ranger outfield, defense, which was shifted to left. He slashed a 3- 2 pitch, and the ball rolled all the way to the wall in left-center. Tarver, who was running on the play, never hesitated.